The state weather bureau PAGASA reported that the Tropical Depression spotted outside PAR is now Tropical Storm. Bagyong Paeng has intensified as it continues to move over the Philippine Sea. Tropical Storm Paeng was located at 1,100 km East of Legazpi City with maximum sustained winds of 95 kph near the center, according to PAGASA 10 AM advisory. The movement of Bagyong Paeng was forecast to move West Northwest at 13 kph. It is expected to be at 925 km East of Daet, Camarines Norte tomorrow morning and at 1,030 km East of Tuguegarao City by Monday morning. By Tuesday morning, it is expected to be at 1,170 km East of Itbayat, Batanes, PAGASA said. Again! 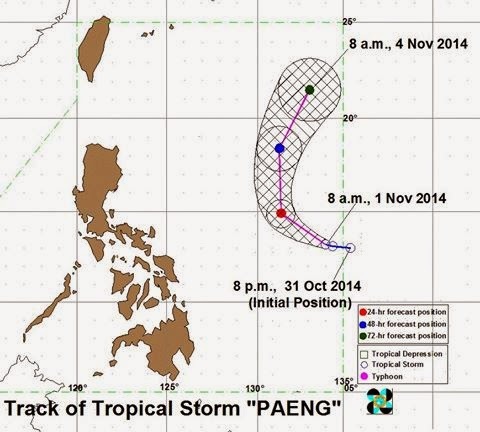 please don't panic because Tropical Storm Paeng is too far to affect any part of the country. However, it will continue to enhance northeasterly winds over the eastern seaboard of Central and Southern Luzon and of Visayas resulting to rough to very rough sea conditions over the aforementioned areas. Fisherfolks and those using small seacrafts are advised not to venture out over the said seaboards, based on all available data of PAGASA. PAGASA next weather update will be incorporated in the Public Weather Forecast to be issued at 5:00 pm today while the next Weather Advisory or Bulletin will be issued at 11:00 am tomorrow or earlier. You may do direct contact to PAGASA, by calling at state weather bureau telephone numbers 927-1335 and 927-2877 or log on to www.pagasa.dost.gov.ph. Comments or suggestions about "PAGASA: Bagyong Paeng intensifies on November 1" is important to us, you may share it by using the comment box below.